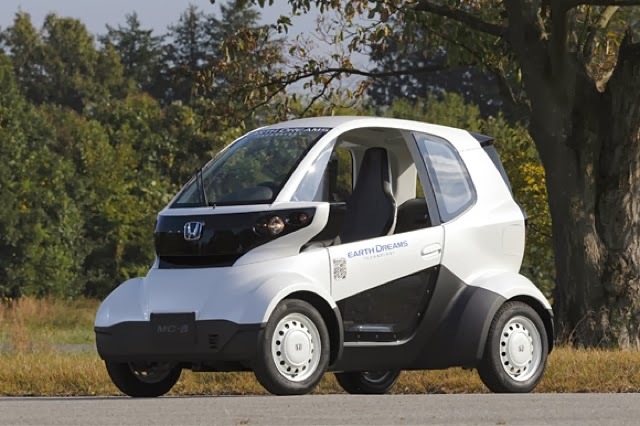 Jumping on the bandwagon of tiny electric vehicles, Honda has unveiled its very own miniature car called the MC-β, pronounced MC-beta. Other recent small EVs were the Mitsubishi i-MiEV and the SmartCar ForTwo. This certainly is meant for eco-friendly short trips around the city. It looks to be a refinement of the company's line of micro commuters and is designed to comply with the "micro-sized mobility products" category that's currently the trend in Japan and Europe. The MC-beta is built on top of a lightweight yet rigid frame and only measures 2,495mm x 1,280mm x 1,545mm, which is about 90cm shorter than the typical mini car. To compare, the locally produced mini car, the Perodua Kancil measures 3,395mm in overall length, 900 mm longer than the MC-beta. The release states it has a 3.3 meter minimum turning radius, a maximum range of 80km or so when fully charged, and speeds of more than 70 km/h. As for charging time, the teensy quadricycle takes less than 7 hours to get fully juiced with a 100V outlet and less than 3 hours when plugged to a 200V socket. Field tests will begin in Japan this month, so we wouldn't expect this in showrooms any time soon. Sure, you won't have room for too much luggage, but at least the MC-beta won't have to resort to funky folding techniques to park in a tight spot. No indication yet but netizens are already debating and arguing that, anything more than $20,000 (RM63,600) is prohibitively expensive. The Mitsubishi i-MiEV starts at $21,625 in the US, but it sells for RM136,000 (approx. $42,760) in Malaysia. For now, let's treat this news piece as "FYI only". In the currently on-going Motor Show in Tokyo, Toyota and other Japanese car makers are also showcasing Eco-friendly (hybrid and electric) cars.